One of the things I always wonder when I see a beautiful, filled in garden in the magazines or in books, is how did they get it that way? By the time we are seeing these inspiring gardens, the owners have probably been working on them for at least 5 years or more (unless they are on a TV show on HGTV). Most people’s garden evolve over time. 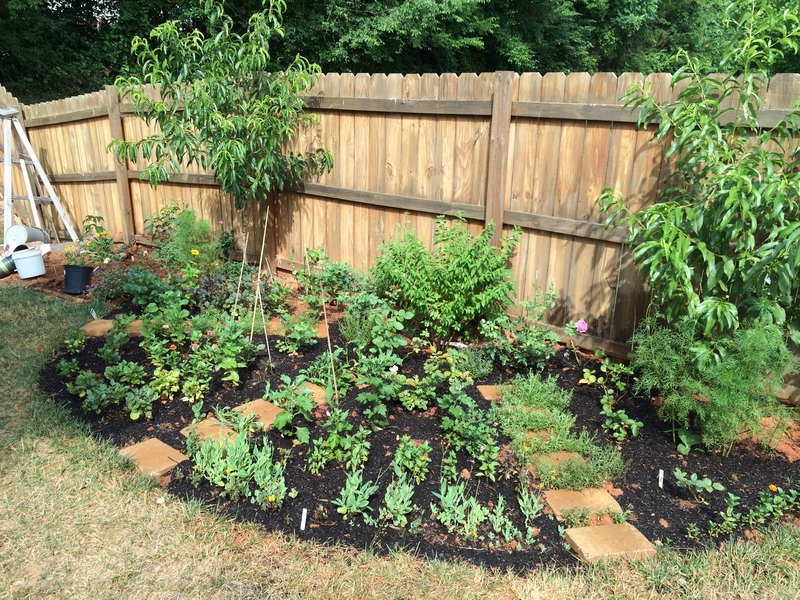 Because I find it fascinating and am always drawn to people’s blog posts about how their gardens evolved, I thought I would document ours and show how it has expanded in small (time-consuming) sections a little at a time. 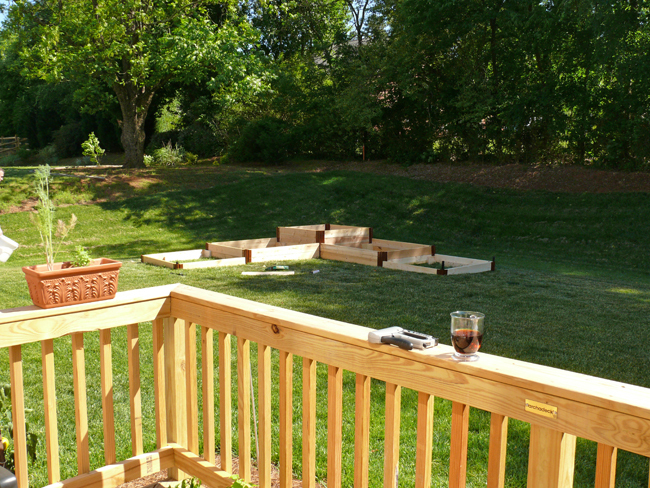 The first summer after we moved in 2010, we added what we called the “Taj Mahal” of garden beds (at least it seemed big to us) using Frame-it-All corners and store bought wood. At this point, the yard wasn’t fenced in. I love how perfect our sod looked then. We got all the boxes filled with mushroom compost and so began our first section of the garden. 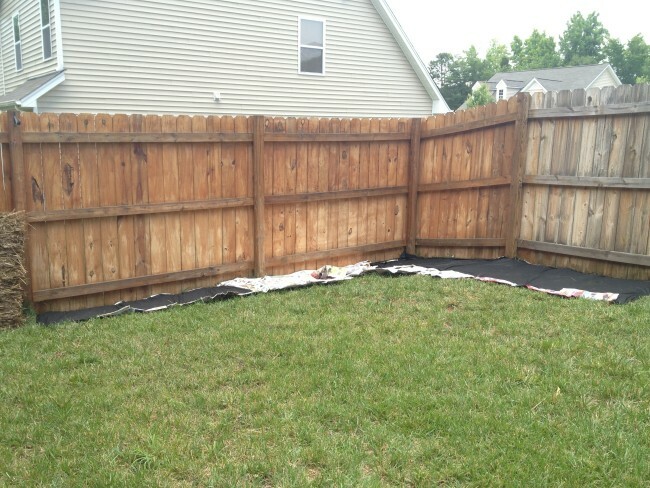 In 2011, we decided to take the plunge and buy a fence. Best money we have spend so far on this house. We have a lot of dogs and bunnies in this neighborhood and this made gardening much safer. 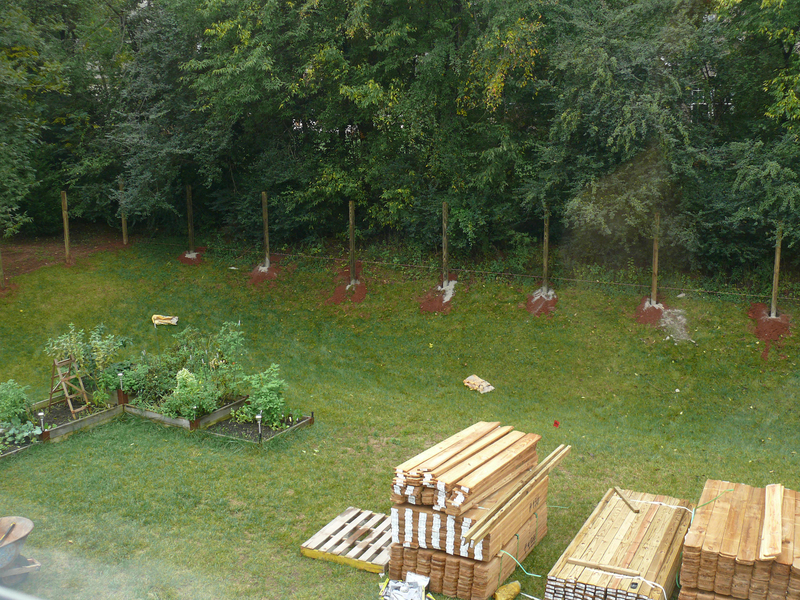 In progress … showing how much more we had growing in the raised beds by 2011. 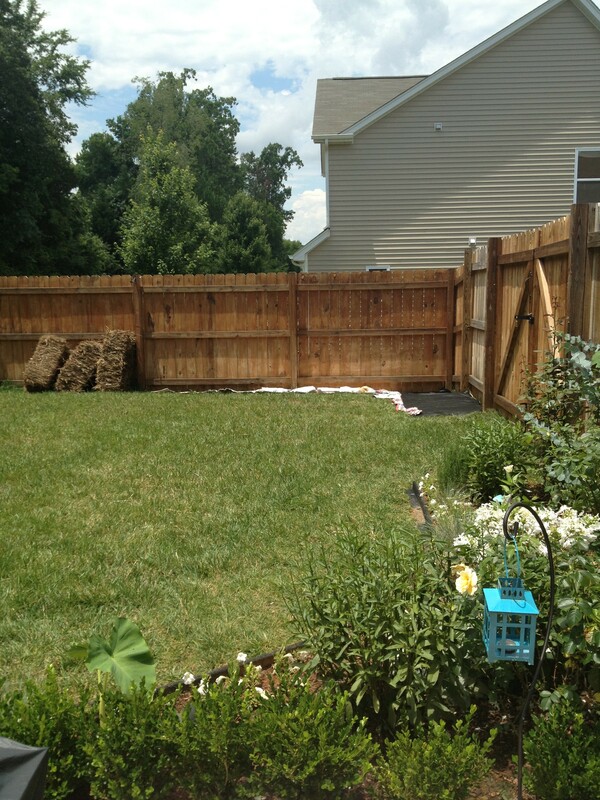 A great wide angle of the whole backyard once then fence was in. The next project involved adding some new planting areas and a place for an expansion of the porch to a gravel porch area outlined by wintergreen boxwood. After planting I laid down black landscape fabric to kill the grass and line the place for the gravel. 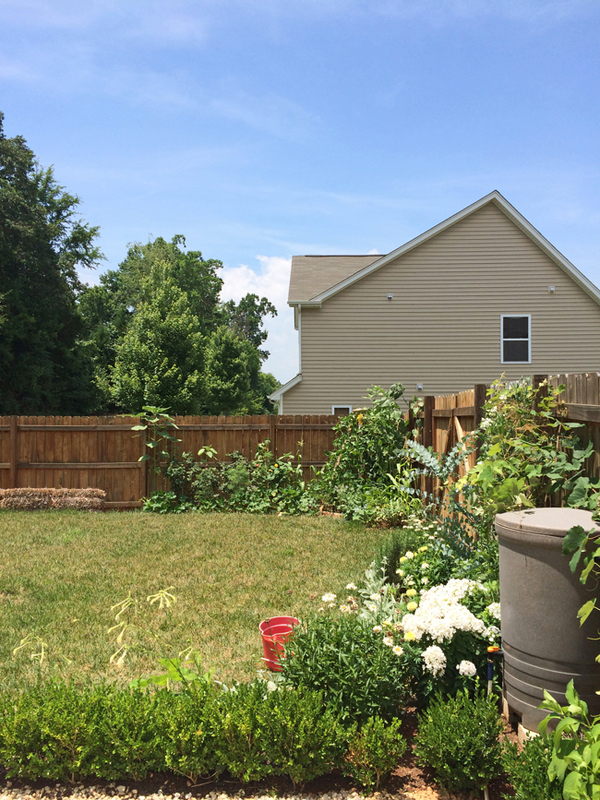 In 2012, my focus was on planting a white garden to the left of the back porch, beside the soon to be gravel patio. 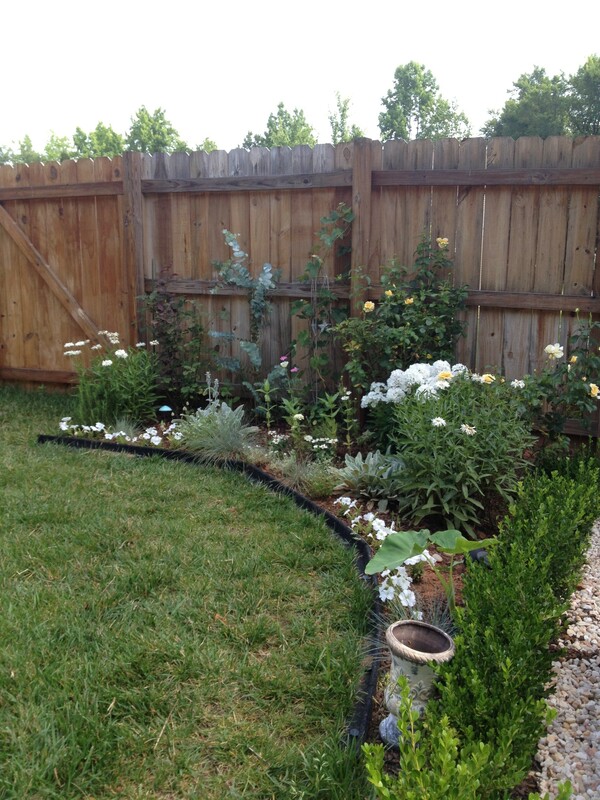 Here is a view of the white garden May 0f 2013. Somehow I ended up with yellow roses, in there, but a rookie mistake. This is a great shot of a young Eucalyptus plant that is now (2016) taller than the fence. I wasn’t sure it would make it in my zone 7B climate. 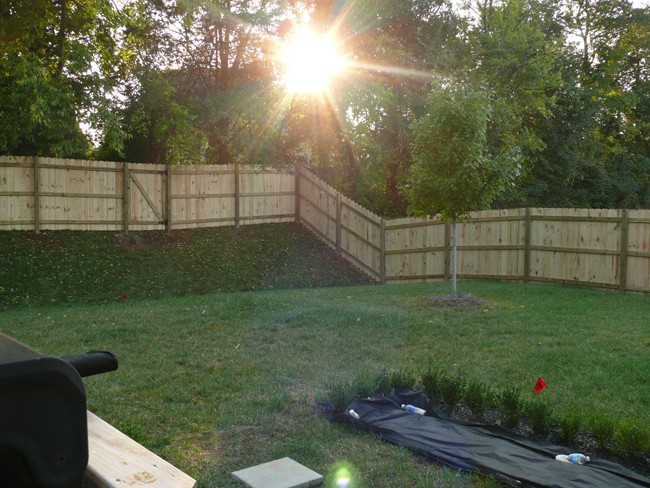 Once we filled in the gravel patio, I focused my attention on the long expanse of fence on the northwest side of the yard. 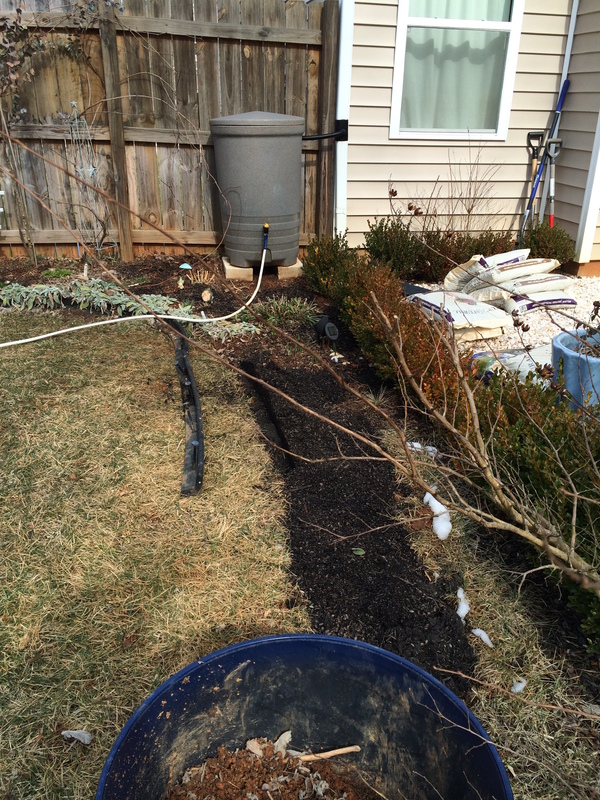 Digging out sod is a major undertaking that I learned from doing the gravel patio. It is back breaking work and then there is no where to put all the sod once its removed. Our city yard waste company will not pick up their collection bens if they are full of 50-100 pounds of sod. For the next big areas I killed the grass by smothering it with brown bags from the grocery store and newspaper. 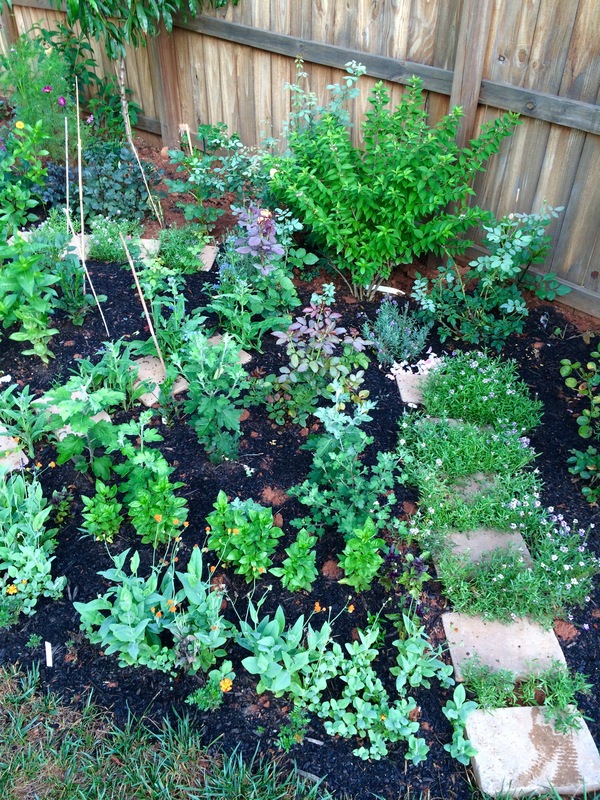 This is my sort of lasagna gardening (minus the green layer). I would then cover it will black landscape fabric and give it 6 months to die before uncovering the area, amending the soil and digging it all up together before planting. 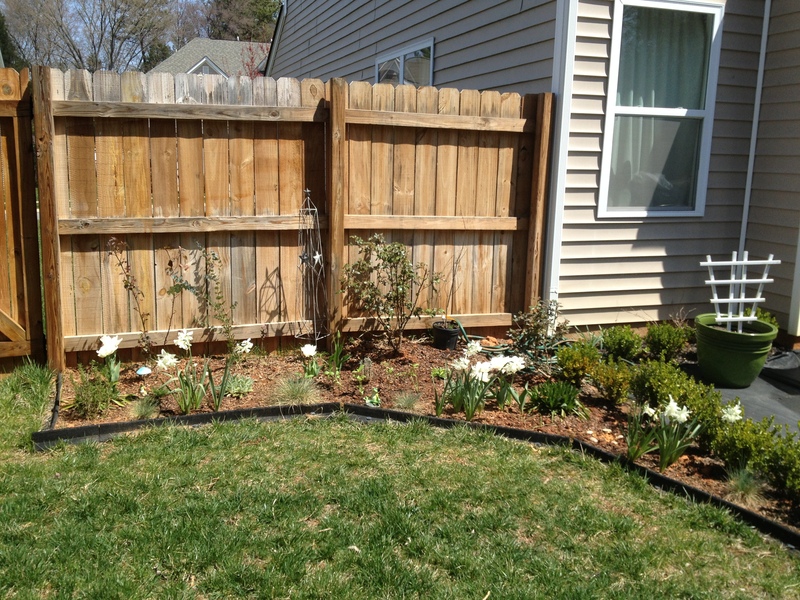 I did that triangle section along the fence to match the exiting white garden corner. It stayed like this till February 2014. 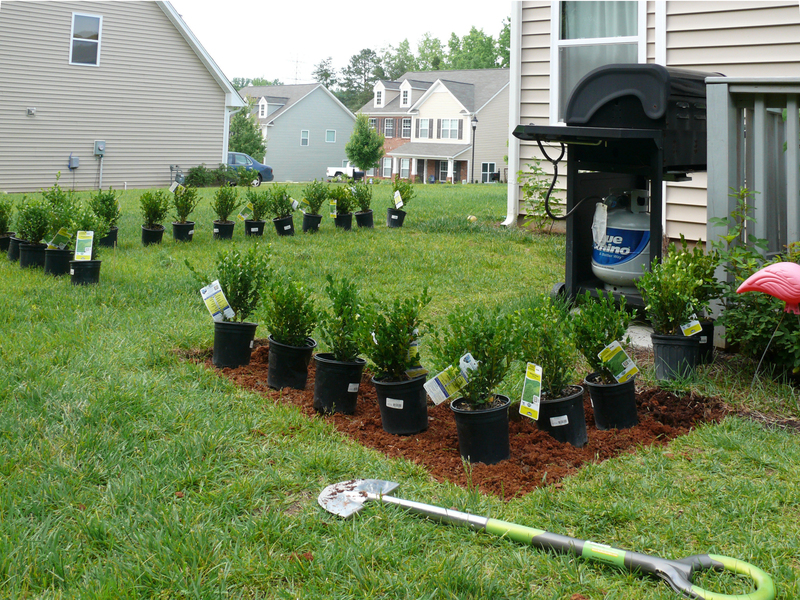 This is how it looked upon planting summer 2014. We also purchased a rain barrel that year, which was not only great for watering, but it also helps keep all the rain from drowning the planting bed and washing all the gravel around. In the fall of 2014 I decided to carry the planting area the rest of the way down the fence towards the back of the yard. I wanted to get a bit creative with this area. 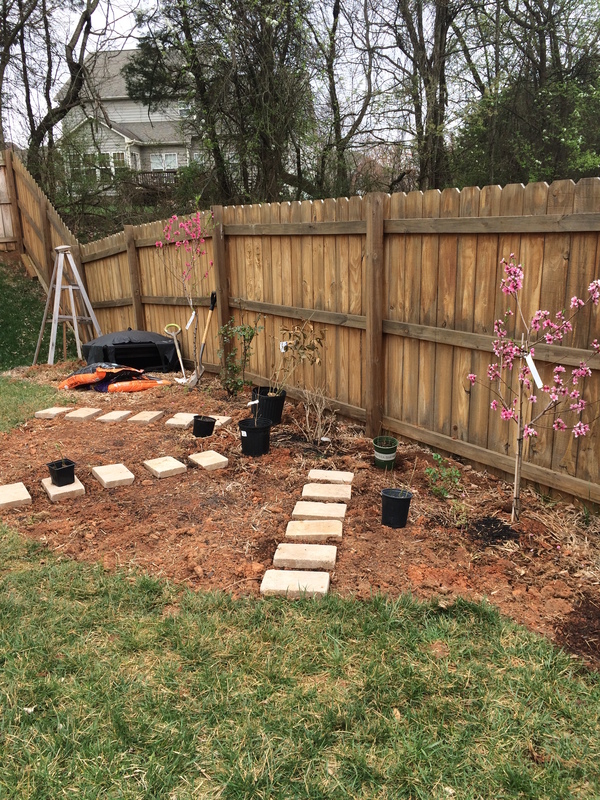 In my mind I saw it as a perfect place to expand my perennial garden with more space for roses and two more peach trees, as well as peonies, and an area for mums and annuals. I decided to make it a semi-circle with stepping stones. I also expanded the white garden along the gravel patio in front of the hedge (in the foreground). The above picture is from January. The below photo is from March 2015 as the peach trees are blossoming. The black pots are David Austin roses waiting to be planted. 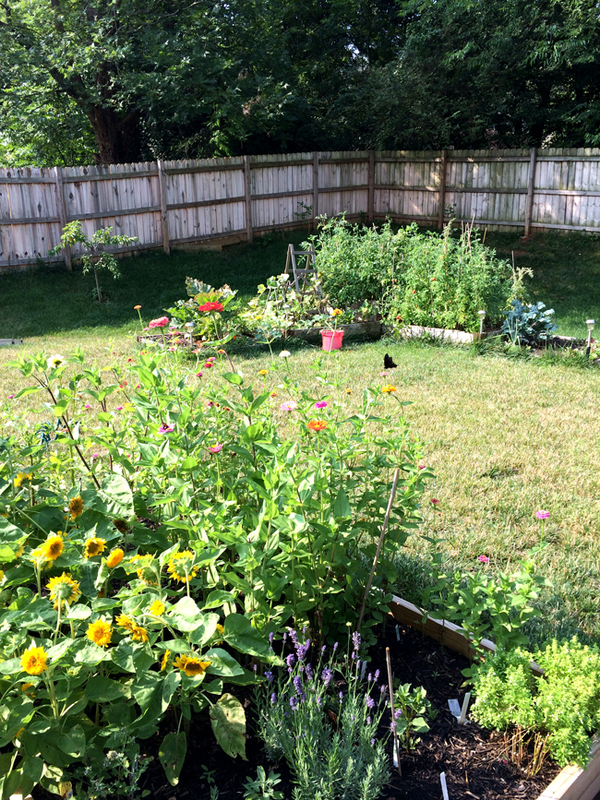 Here are some photos of the new semi-circle garden in mid summer. Here is this side of the yard in late summer. The grass was a bit burnt out, but the flowers were still going. This is a view of the rose garden by the gravel patio as we were digging it out. It must have been after a rare snow as you can see snow on the ground. Next, we will move over to the right side of the porch where my original two planting beds were dug. 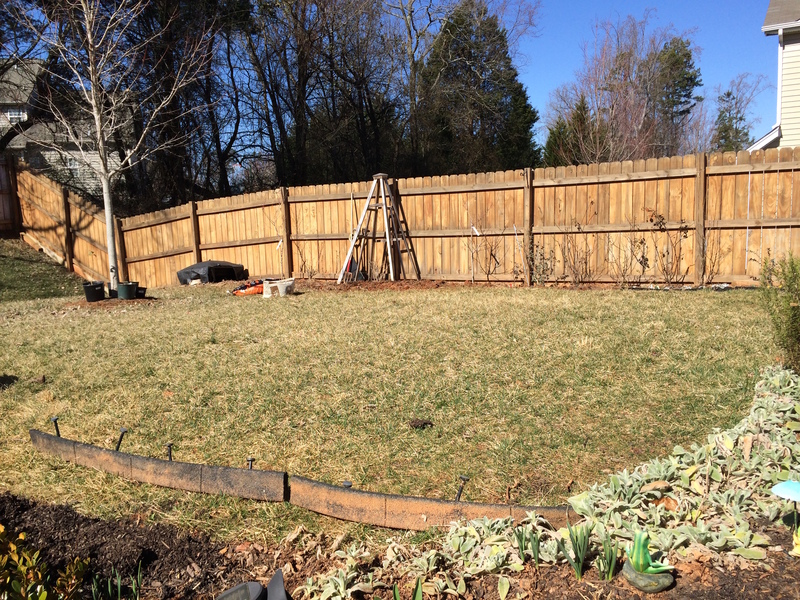 These were the first beds I installed once the fence was put up. This was in 2011. 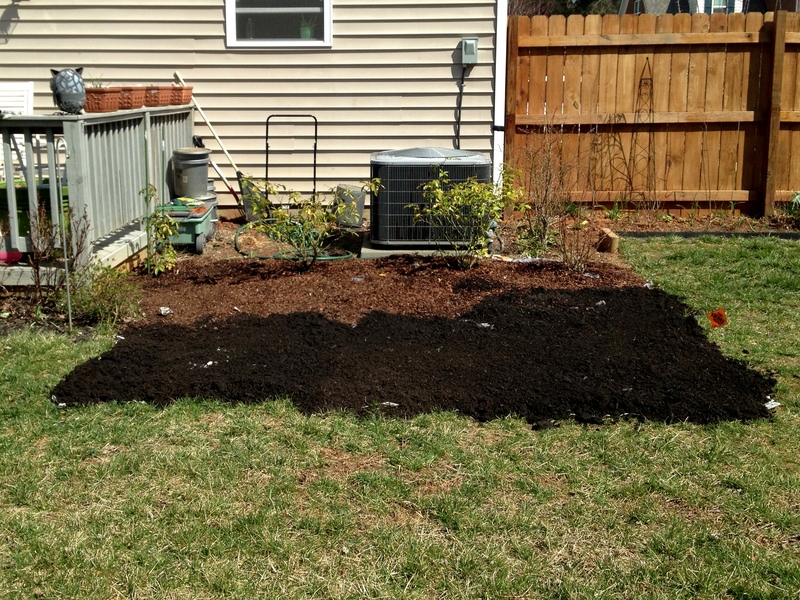 It was my first true flower bed. Home to a very large artichoke plant and my little zinnia seedlings obviously I must have seeded them directly as they are all crowed together. This area was the work horse of the first few years where I grew almost all the flowers. Zinnias, sunflowers and Echinacea all crammed in. And another bed I added when I realized the above bed wasn’t enough. Originally, I was going to make this all roses, but in 2014, I decided to add in another raised bed for flowers and herbs instead. 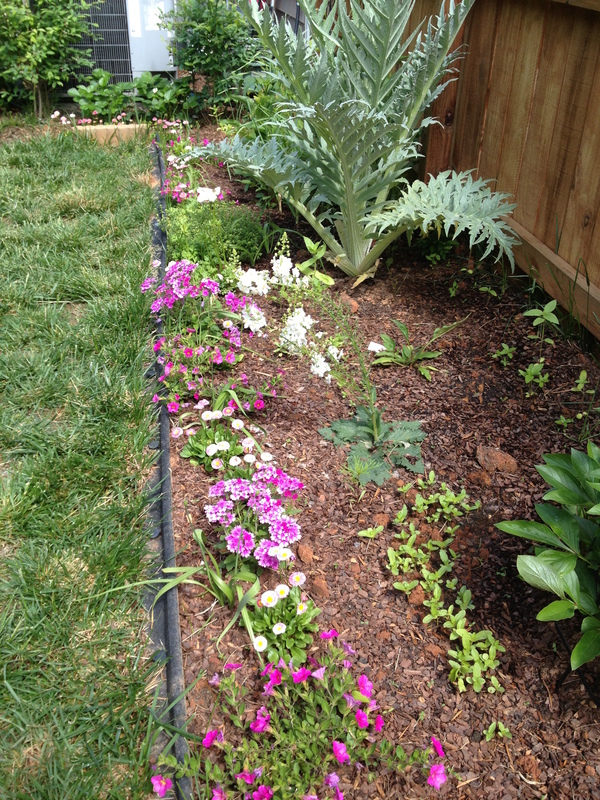 Here it is mid summer along with the other raised beds from before. You can see a peach tree on the left by the fence. 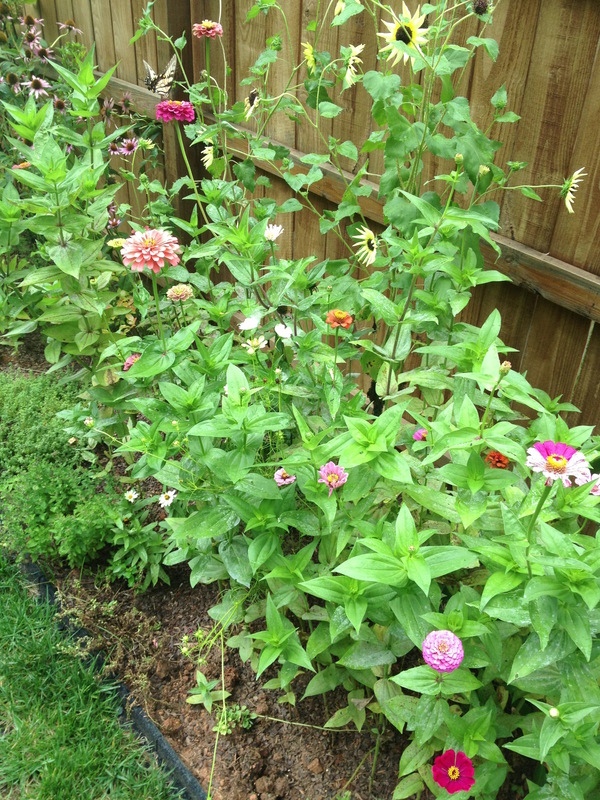 The black mark in the middle of the picture I think is a butterfly on one of the zinnias. 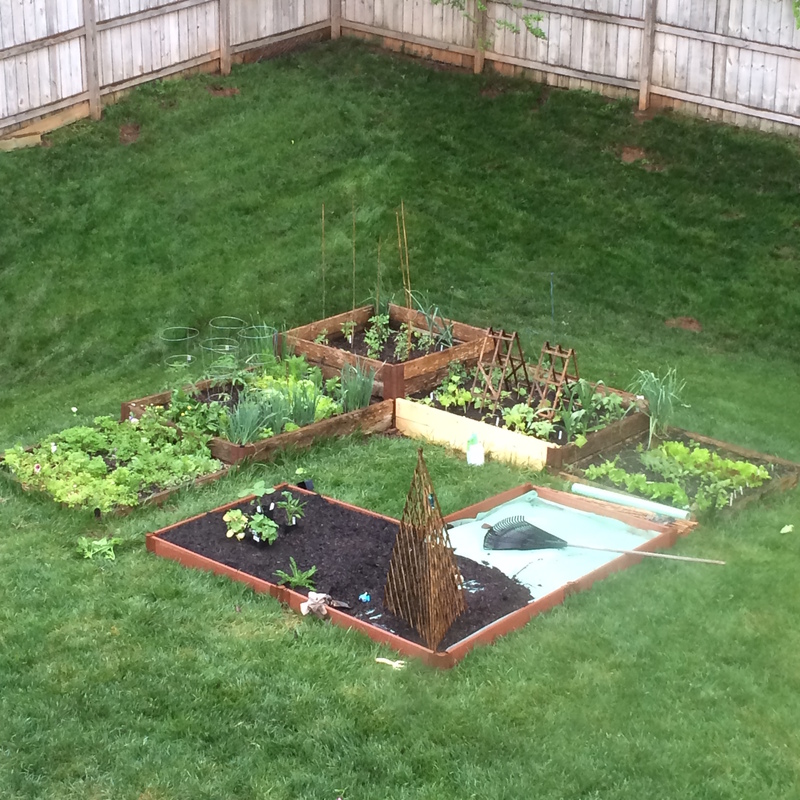 Finally, last year in 2015, we added another group of raised beds (supposedly for more edibles) though it ended up with more flowers in it. Sadly, with our drought and the shallowness of the beds, nothing really took off last year. I plan to raise it another level so it will be about 16 inches tall this summer. The top left shallow bed is home to my ranunculus and anemones. There are more beds on the sides of the house in the shade for the hydrangeas and shade loving flowers. I hope you have enjoyed seeing a walk through of our garden. It amazing how much you can grow in a 0.25 acre backyard and I am sure I will find more places to grow even more. 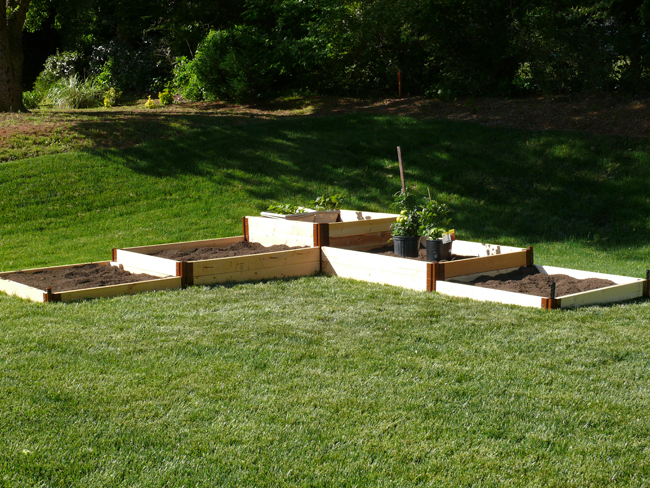 Stay tuned fore more posts on additional beds I plan to add this spring for more roses and mums.